Matilda E. Barnett was the wife of Captain Woodbury Tinsley, of Ohio County. The daughter of Joseph C. Barnett and Frances Bennett, Matilda was born December 16, 1842. She and her husband, who was a captain in the Civil War, raised four children – Elmer, Orlistis, Wilburn and Etta. Captain Tinsley died May 16, 1907, and his wife survived another eighteen years. Don’t you love small town newspapers that give peeks into the everyday lives of our ancestors? 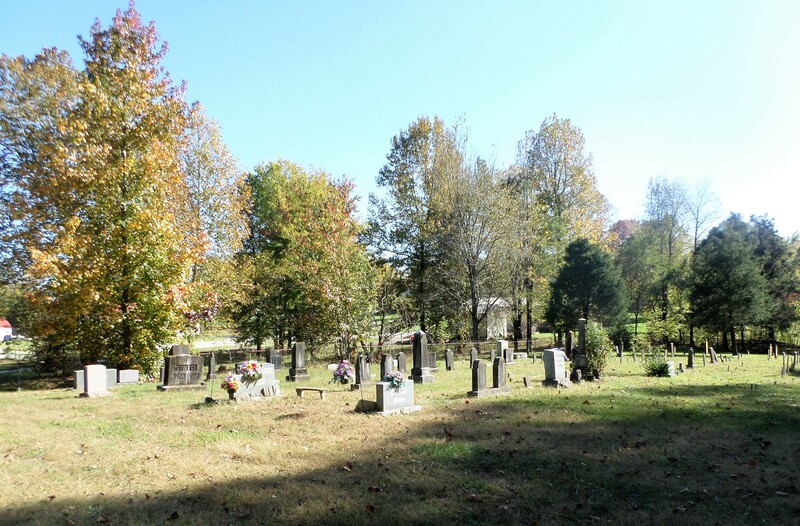 Alexander Cemetery, Ohio County, Kentucky. Matilda Tinsley made her will at the end of 1919 but lived another six years. Son Elmer was deceased by this date. She was buried in Alexander Cemetery, but unfortunately we did not take a photo of her gravestone while visiting the cemetery last October. Whereas I, Matilda E. Tinsley, of Hartford County, Kentucky, deeming myself mentally capable and desiring to make complete and final disposition of my property, after death, do make and publish this instrument as my last will and testament. First – It is my will and desire that my body receive the usual and customary burial, and that a monument, the exact duplicate in so far as possible and practicable, shall be erected at my grave as that marking the resting place of my deceased husband, Woodbury Tinsley, and that all expenses incident to any sickness, my burial and for the monument erected, be first fully settled. Second – I will, devise and bequeath all of my property, both real and personal as well as mixed, to my four children, viz., Elmer E., Orlistis R. and Wilburn S. Tinsley, and to Etta M. Bennett, share and share alike. To have and dispose of in any manner as seemeth best in their judgment, after division shall have been made. Third – It is my desire except as my said four children may otherwise mutually agree, that the four Liberty Loan U. X. Government bonds which I possess in the sum of $50.00 each to be divided one to each beneficiary herein named. Fourth – Deeming it best perhaps that such of my personal effects as bedding, household and kitchen furniture, and kindred articles be sold, and the proceeds be divided, I make that direction except, however, in case my Executors, whom I shall hereafter name, and who shall qualify unanimously agree otherwise. Fifth – It is my express desire and I hereby empower and clothe my Executors with full authority to transfer, sell and convey any and all real estate of which I may die seized or possessed, making the title absolute and as lawful as I myself could if living. 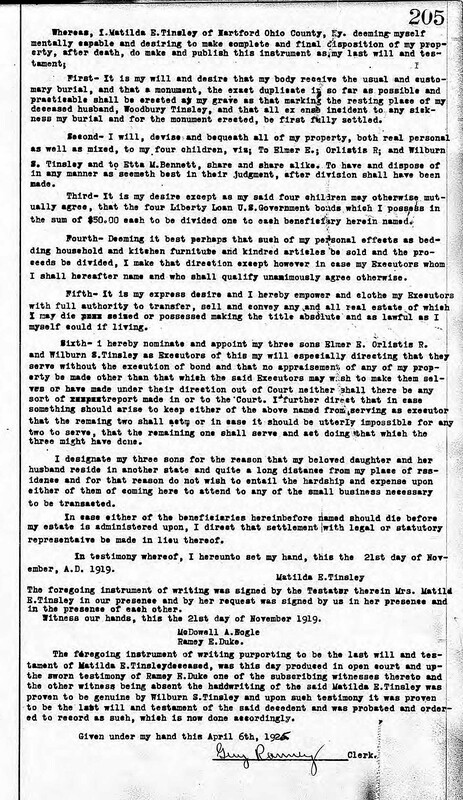 Sixth – I hereby nominate and appoint my three sons, Elmer E., Orlistis R. and Wilburn S. Tinsley as Executors of this my will, especially directing that they serve without the execution of bond and that no appraisement of any of my property to be made other than that which the said Executors may wish to make themselves, or have made under their direction out of Court, neither shall there be any sort of report made in or to the Court. I further direct that in case something should arise to keep either of the above named from serving as executor, that the remaining two shall act, or in case it should be utterly impossible for any two to serve, that the remaining one shall serve and act doing that which the three might have done. I designate my three sons for the reason that my beloved daughter and her husband reside in another state and quite a long distance from my place of residence, and for that reason do not wish to entail the hardship and expense upon either of them of coming here to attend to any of the small business necessary to be transacted. In case either of the beneficiaries hereinfore named should die before my estate is administered upon, I direct that settlement with legal or statutory representative be made in lieu thereof. In testimony whereof, I hereunto set my hand, this 21st day of November, A.D. 1919. The foregoing instrument of writing was signed by the Testator therein, Mrs. Matilda E. Tinsley, in our presence and by her request was signed by us in her presence and in the presence of each other. Witness our hands, this the 21st day of November 1919. The foregoing instrument of writing purporting to be the last will and testament of Matilda E. Tinsley, deceased, was this day produced in open court and upon the sworn testimony of Ramey E. Duke, one of the subscribing witnesses thereto and the other witness being absent, the handwriting of the said Matilda E. Tinsley was proven to be genuine by Wilburn S. Tinsley, and upon such testimony it was proven to be the last will and testament of the said decedent, and was probated and ordered to record as such, which is now done accordingly.